Gardening is a passion of mine, and building a vegetable garden free from pests is a must. 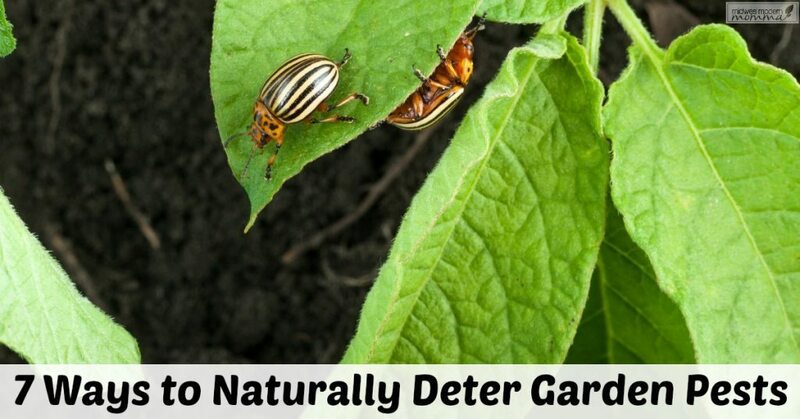 To have a healthy harvest, I prefer organic gardening, and for me, that includes using these natural pest deterrents to keep critters away from my plants. While I am focusing on a vegetable garden here, you can easily use these pest deterrents with your flower garden. The focus is to have an organic garden if possible, and that includes not just fertilizer, but also what we use to keep things like deer, rabbits, squirrels, and even birds away from our plants. 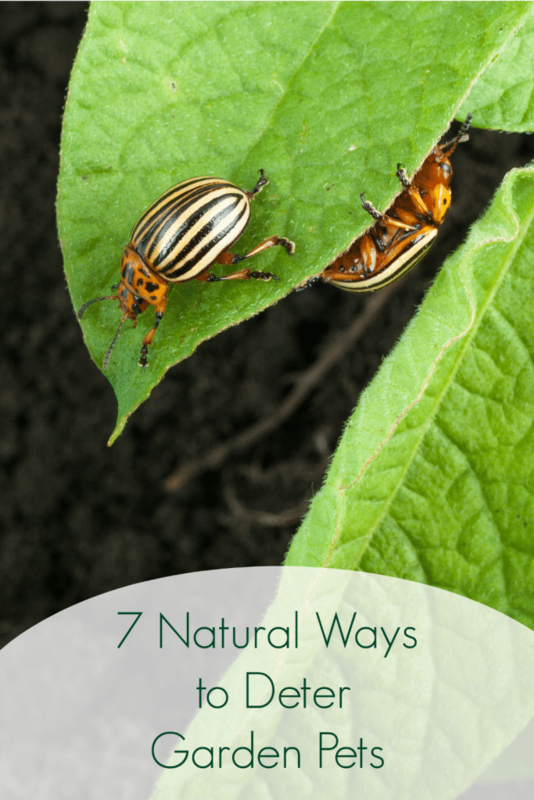 These natural pest deterrents are easy to come by, and of course make me feel better about what I eat from my organic vegetable garden this summer. Natural Pest Spray: Check out my recipe for natural pest spray made with just a few simple ingredients it is safe for you, kids, and pets but deters a lot of common garden pests. Make a big bottle and keep it on hand for vegetable garden maintenance a couple times a week or more often when it rains. Beer: Even if you don’t drink it yourself it’s a good idea to keep a can or two on hand. Stale beer can be poured into shallow dishes and used to lure slugs, bees, fruit flies, and wasps in where they drown (beer is also a good fertilizer.) If beer is your thing go ahead and crack one open for yourself while you toil in the hot sun, I won’t judge. Cornmeal: Have any ant beds cropping up in your garden? No one wants to be covered in ant bites while working away in the soil! Sprinkle cornmeal over the beds and while it may take a week or two this is a good way to kill them off naturally (cornmeal is also a great fungicide). It's a great cheap pest deterrent for your vegetable garden that you can grab right from your pantry! Ladybugs: They are pretty and guess what? They are voracious eaters of the common garden pest-aphids that plague tomatoes, roses, and more. You can usually pick them up at Home Depot in the spring or order live Ladybugs through a reputable seller on Amazon. Release them in the evening since they don't like to fly in the dark and will stay put. Make sure the garden is very wet. Ladybugs are dehydrated when in the packs for shipping and this will ensure that they find your garden inviting! Diatomaceous Earth: Great for killing aphids, ants, flea beetles, spiders, scorpions, roaches, silverfish, ants, and squash bugs anywhere in your vegetable garden or home. You should look for food grade Diatomaceous Earth on the bag. Sprinkle lightly over your vegetable garden, and then simply dust your garden again as needed. You can also sprinkle it around the perimeter of your house to stop them from finding their way inside! Eggshells: If you have deer nibbling away at your precious plants sprinkle crushed egg shells all around your vegetable garden. Deer detest the smell of eggshells. Crushed eggshells are also said to deter slugs and snails. Hand Remove: Beetles, caterpillars, snails, slugs can easily be removed by hand. There are so many little creatures that want to destroy your beautiful garden that you simply you can’t be weak here. They have to go, and sometimes that is by hand. If you see them or their eggs, go ahead and pick them off and dispose of them. Additional tip: If you create a garden that is inviting to your feathered friends they will help you dispose of larvae and bugs by making lunch out of them – you can’t get much more natural pest control than that! This summer as you work in your vegetable garden to produce a healthy harvest of your favorite vegetables, take advantage of these great tips for natural pest deterrents. You can keep up with your desire to stay organic while ridding your garden of the critters trying to impede your progress.